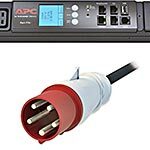 APC Metered Rack Power Distribution Units (PDUs) provide active metering to enable energy optimization and circuit protection. User-defined alarm thresholds mitigate risk with real-time local and remote alerts to warn of potential circuit overloads. Metered Rack PDUs provide power utilization data to allow Data Center Managers to make informed decisions on load balancing and right sizing IT environments to lower total cost of ownership. Metered Rack PDUs include real power monitoring, a temperature/humidity sensor port, locking IEC receptacles and ultra low-profile circuit breakers. Users can access and configure Metered Rack PDUs through secure Web, SNMP or Telnet Interfaces which are complimented by APC Centralized Management platforms using InfraStruxure Central, Operations, Capacity and Energy Efficiency.